Just because a recipe says to use a certain kind of cut of pork doesn't mean you have to use that cut or even pork! (This rub would work well on chicken, too!) And just because a recipe is meant for the oven doesn't mean you can't cook it in a different manner. Case in point: this recipe. The original recipe uses a pork loin, is baked in the oven and has more heat. I had pork chops, opted for the grill and cut back on the red pepper, but you can go back to the original, if you like. It's your kitchen! Do what you like! Preheat the grill. Combine the paprika, red pepper flakes, cumin and salt in a shallow dish. Rub the pork chops all over with the olive oil, then liberally sprinkle the spice mixture over the chops to coat. Grill the pork chops until cooked. 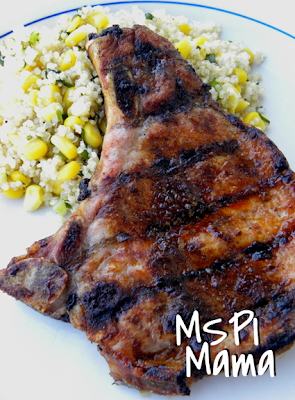 (If you are using a thin cut, grill the chops over a high heat for 4-5 minutes. If you are using a thick cut, start grilling the chops over a high heat with the lid closed, flipping the chops after 1 minute. Close the lid for one more minute. Then turn the heat down to low or move the chops to the cooler side of a charcoal grill and grill with the lid on for 6-8 more minutes, flipping halfway through.) Transfer to a cutting board and let rest 5-10 minutes. Meanwhile, bring a large pot of salted water to a boil. Add the quinoa and cook until tender, about 10 minutes. Drain and fluff with a fork. Toss with the corn, scallions, parsley and salt and pepper to taste.